Wow..the new EFS-Web system from the Patent and Trademark Office is really impressive. Finally, an electronic filing solution that's really a solution...and not just an additional problem. There's one apparent feature of the system that has gone unnoticed, though. Not only can you file PATENT APPLICATIONS electronically, but, from the looks of the Office web site (see image at right), you can file PATENTS using the same system. Awesome. Write it up, and file it. Patented at the click of a button. What on earth will they think of next. (OK, call me a stickler if you want...I won't complain. I'd buy the Office dozens of copies of my favorite grammar book if I could). When I first saw Fig. 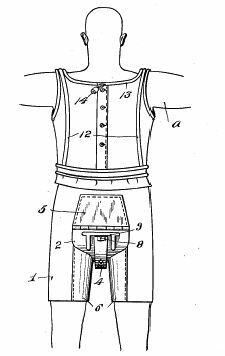 1, I thought the invention might be a sexual armor you wear when playing basketball (ergo the sharp looking basketball uniform the model is wearing). Hey, it can get kind of tough fighting for those rebounds. It is a deplorable but well known fact that one of the most common causes of insanity, imbecility and feeble mindedness, especially in youth is due to masterbation or self abuse. This is equally true of both sexes. Wow. Life 100 years ago must have been rough. Today it just makes you go blind. Just what I want…surgery to implant a watch in my arm. Joy! Notice how the draftsman goofed? Shouldn’t the display on the clock be upside down (or the thumb on the other side of the hand) so the wearer could read it right side up? 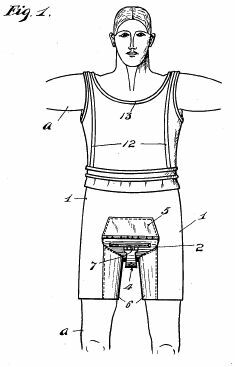 Of course, at least this way you can see what time it is before the inventor backhands you across the face for mocking his invention.